Chapter 1. Trimsos 3, Sittangbad 2. ...and so Trimsos go through to the second round! 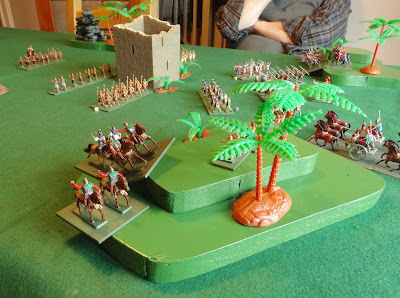 Okay, so this was the third engagement in the Trimsos Project initiated by Stuart and myself, and we played the Sittangbad scenario for the second time (although for the first time in the ancient period). Our little set of rules therefore had a further playtest, with me taking copious notes as various situations were discussed. Finding someone you can really co-operate with when developing rules is a great experience - not everyone can do the give-and-take required. And of course, for ideas on an Old School-style set of rules, who better to work with than one of wargaming's great Old Schoolers? The only problem is, each iteration gets more and more like Charge! for ancients! (Only joking Stuart). 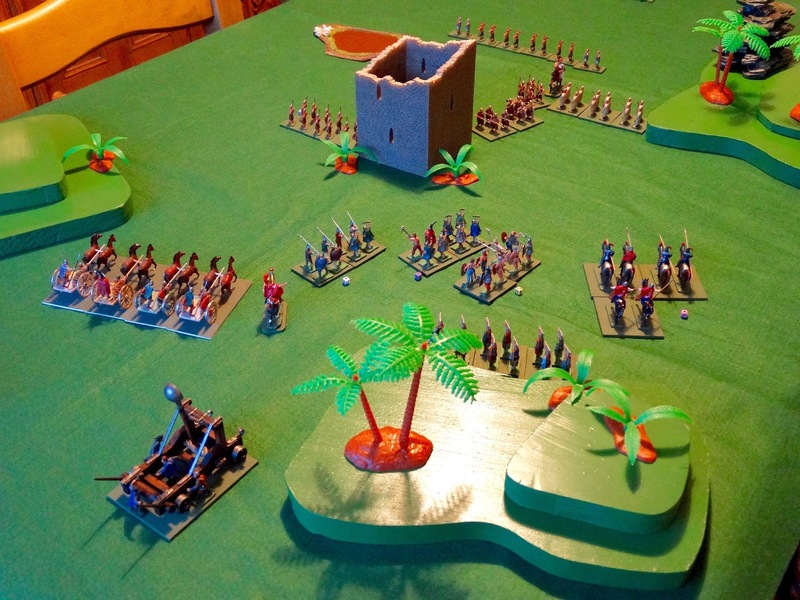 The set-up was of course inspired by the classic Battle of Sittangbad. Palm trees were substituted for those seen in the original battle, and some ruined buildings suggested Sittangbad and Eisenberg. All, as usual, on Stuart's 6' x 3' dining table. The set-up. 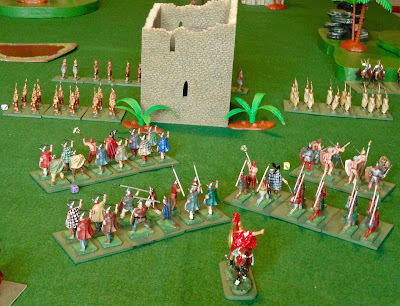 The attacking forces are shown as set out to indicate what was available. Arrival on the table would be in sets of 4 units on consecutive moves. I took the attacking side. My heavy infantry is seen here pushing forward to clear the area around the ruined castle keep (a Hornby Skaledale model). One of the defending units has already been seen off (right of photo). Unfortunately Stuart hadn't read the script - I thought Sittangbad was all about a delaying action, but instead I was subjected to an aggressive defence. 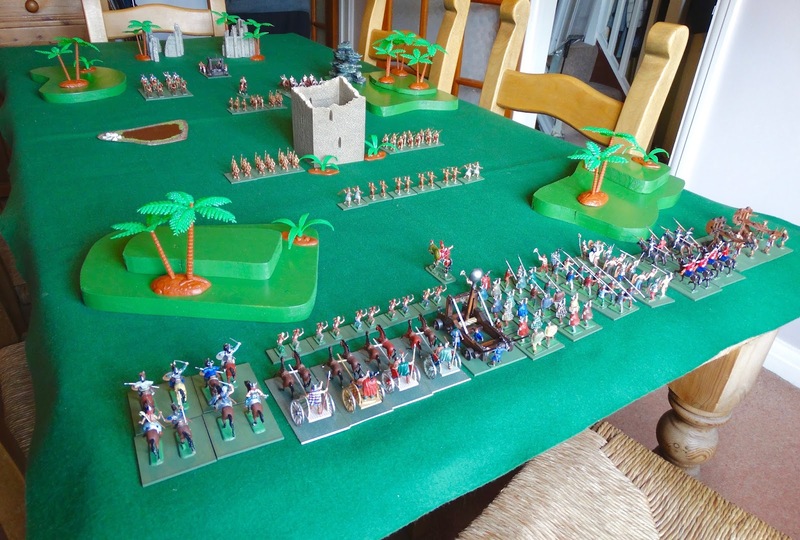 In the foreground, Stuart's 'reserve' cavalry has charged forward and is outflanking my left. They have already seen off my light cavalry. My slingers are just visible behind the tress, and these were to be the next victims. Although down to half strength, the enemy cavalry is still in being and continues to threaten. My own units are also rather depleted, but my heavy cavalry is attacking on my right. 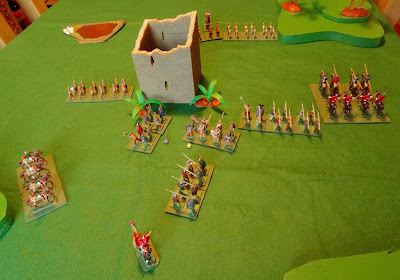 Stuart's heavy cavalry have finally been destroyed, but my own infantry units have suffered heavily trying to dislodge the enemy from around the ruined keep. The impetuous charge of my heavy cavalry has been defeated and they are back where they started. My chariots are keen to advance but my forces have suffered too heavily and 'Sittangbad' seems a long way away. With little chance of getting anywhere near the enemy's baseline, I conceded. Stuart toasts his victory with tea in his favourite Gloucester Rugby mug. Honestly, there's nothing worse than a smug winner. Chapter 2. In Which I Become A Wargames Butterfly. 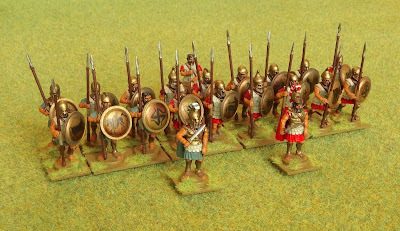 "Let no man set out lightly upon the war-gamer's path, for it is fraught with perils..."
This whole Trimsos thing started as a nostalgia event to refight a classic wargame, but has metamorphosed into an informal project to develop and use a set of simple, Old School ancient's rules for the occasional battle. I have enjoyed the whole thing so much that I have made the momentous decision to open a third front in my wargaming, or to put it another way, I'm starting a third period to add to the SYW and WW2. 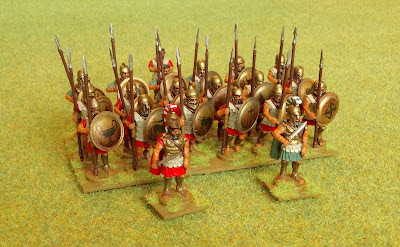 I suppose I'm technically already an ancients player, as I have a couple of 15mm DBA armies gathering dust somewhere, but they were always a sideshow. It was time, I finally decided, to jump in with both feet. Why? Well, in over 40 years of wargaming, 'Ancients' is something I have never done. Just not my area of interest. However, the Trimsos Project had a few unique features which seemed inexorably to draw me in. Firstly, we followed the example of Donald Featherstone and Tony Bath from the original Trimsos game by using ancient armies that were very much generic - that is, any figures from the ancient period would do. To use the phrase from War Games, "what are a few hundred years amongst so many?". 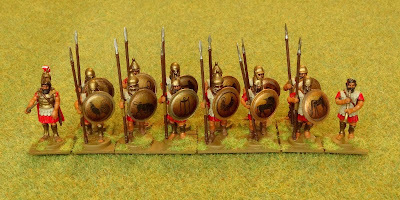 This opened up a fascinating vista - no need to decide on a period and restrict my choice of armies to that epoch. I could mix and match whatever ancient figures took my fancy and mould them into forces balanced any way I chose. 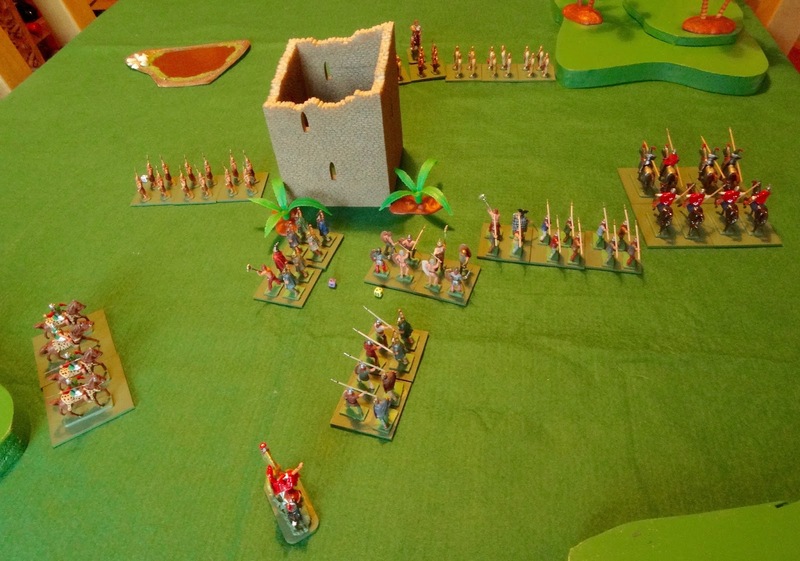 It is of course common for ancient wargamers to fight battles between armies that were not historical opponents, particularly those wargamers using the various WRG rules. 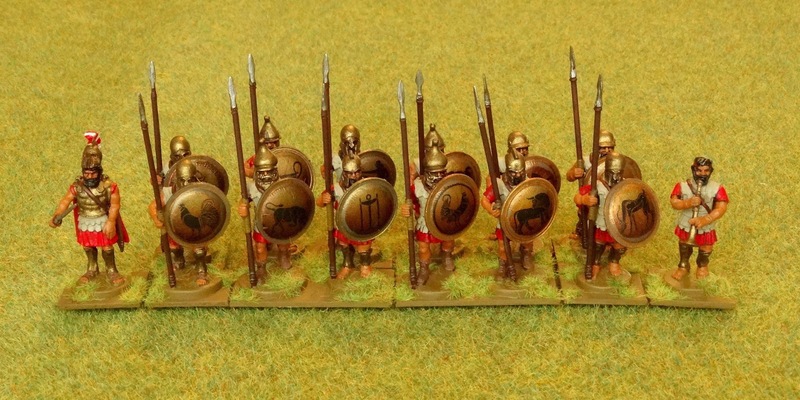 The Trimsos project extends that concept into the armies themselves - units from different eras of history (roughly from 1500BC to 500AD) can fight alongside each other under the same general. 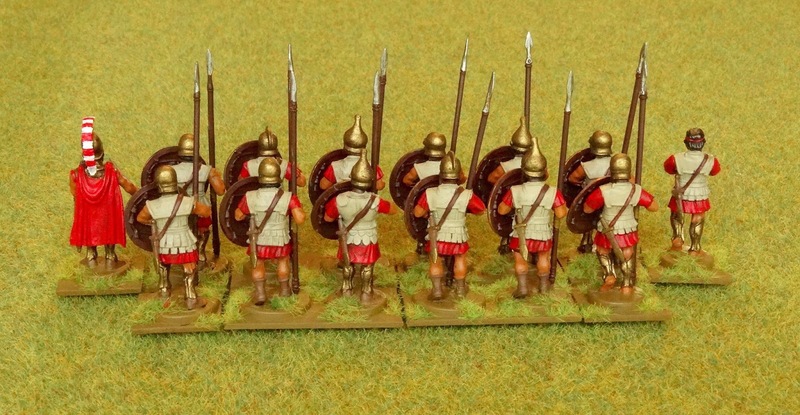 All they had to do was fit into a basic division of infantry or cavalry, then either light or heavy, as used in the original Battle of Trimsos. I don't reckon that this total of figures (around 150, plus chariots, elephants and war engines) should be too great a target. The secret is to to enjoy the process of creating the new armies whilst also continuing to enjoy the periods I am currently playing. Assembled and undercoated (sans shields, of course - they go on last), you can see what nice figures these are. The dark brown undercoat was an idea I found online. It works very well for me. as the opposing forces. These chaps will form the core of the Hyperborean infantry. Rear view. I find these multi-pose hard plastics much easier to paint than metal figures. My basic block painting produced a result I was entirely pleased with, in a fairly quick timescale. Even assembling the figures was quite a fun experience. The first 6 figure tranche of the next unit. Yes, 18 figure units do look better, but I must be patient! 18 figures in 2 ranks. The paint schemes are of course entirely of my own invention - another plus for the project! The final plus of this project (so far) is the pleasure of creating the rules. Of particular interest is the process of sticking to the simple, original concept whilst writing rules that don't feel anachronistic to modern players. Hence, for example, troops will be 'light' (or 'skirmishing') or 'heavy' ('formed') only. Also only straightforward, unashamedly old-fashioned combat mechanisms will be used, along with a basic move-fire-melee turn structure. And no modern-style command and control. You get the picture. This is not the game for dedicated ancients fans. History will be toyed with and often just plain ignored. Forward to the 1960s! Chapter 3. 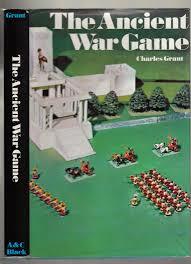 A Book of Two Smells - The Ancient War Game, by Charles Grant. However gently I'm taking this project, no wargaming that I take part in will ever miss out on the opportunity to buy books. This one I found I couldn't overlook, as it combined some fine old games with a description of the various main eras and countries that make up the ancient wargaming period. It cost me £25 on Amazon, including p&p. A fine read, in Mr Grant's usual avuncular style. Two smells? Well, first the lovely small of an old book - don't you just love that aroma? And secondly, the smell of When Wargaming Started To Go Wrong. 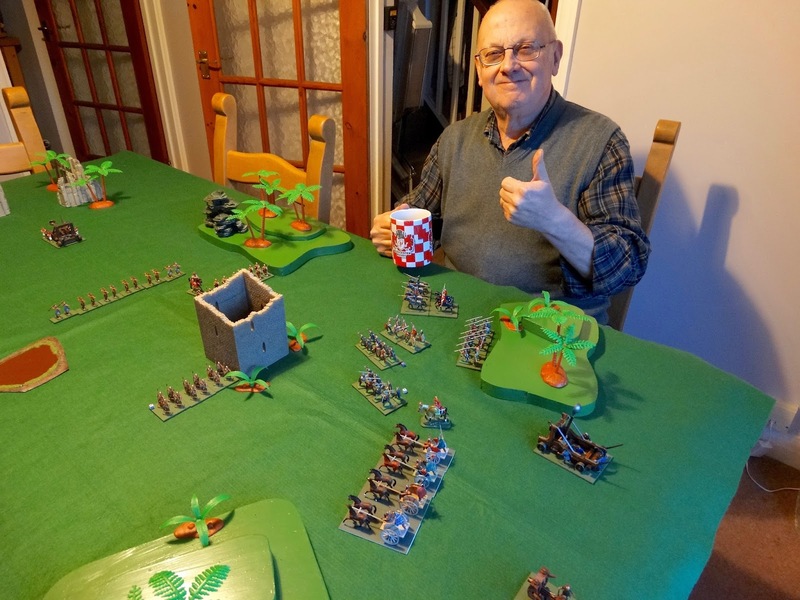 Charles Senior is immensely pleased with the rules that had taken ancient wargaming by storm in 1974 - those of the Wargames Research Group, in their 3rd Edition when the book was written. "Certainly, any improvement could only be trifling", he states triumphantly. Ah well, 4 more editions were to come, then DBA, DBM, DBwhatever, etc, etc. As an exercise I downloaded the WRG 3rd Edition rules, which are still available on the internet (thanks to the History of WRG page). 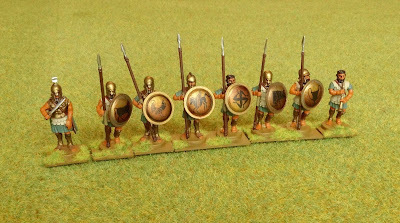 Frankly, I am happy these have been consigned to the dustbin of wargaming history. 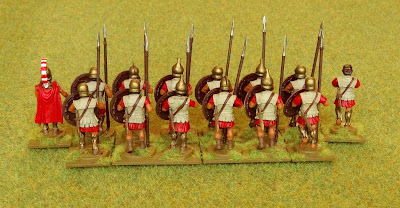 Reading them brought back memories of watching WRG ancients games at the Southampton and Bath clubs back in the 1980s - mostly, the games seemed to consist of people compiling lists of plus and minus factors on pads of paper every time firing, melee or morale were being conducted. The impression was one of extreme tedium, and was probably a major reason I never got into ancients! To be fair, WW2 wargamers were stuck with equally awful rule sets, like the unplayable Firefly rules (which appear to been played by a fair number of people - how did they do it?). 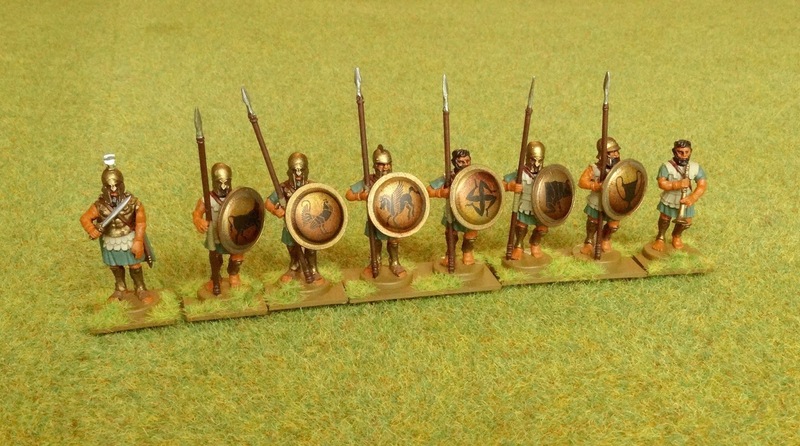 Anyway, suffice to say my own nostalgia (and I think I can say Stuart's as well) certainly doesn't include any set of WRG ancients rules, although the first edition is well worth a look for old times' sake. The other book I will acquire in time is Tony Bath's Ancient Wargaming, published by John Curry's redoubtable 'History of Wargaming' project. Not that I'm going to start any ancient period campaigning, but I want the background to Mr Bath's wargaming world, and especially ideas for the names of countries, generals and units to add spice to my own gaming. Why copy Tony Bath? Simply as a tribute to his contribution to wargaming in general and ancient wargaming in particular. It is important to me to reference my sources of inspiration. For me, the early works of the wargaming greats form a sort of imaginary history (if you will), encompassing the beginning of the modern hobby of wargaming. Having largely set aside real history, keeping in touch with this spirit is a vital part of the Trimsos Project (at least for me. Stuart probably thinks I'm nuts). Anyway, Christmas is coming up, so no need to buy straight away! So, it seems a lot of threads are coming together to make this new venture inspiring. I have high hopes, tempered with a reasonable amount of caution. I will of course keep you all posted. But seriously, I really enjoyed this post and a lot of it rang true. I too have tried to get into 'Ancients' but have never really been able too, often for similar reasons to yourself. So I'm really looking forward to seeing how this project progresses. Maybe an Imagi-Nations route is one to take, as I have done for the 18thC, really so that I can use the troops I like and not be too bound by history. You're bang on, Steve. This is going to be very much an imaginations project. Absolutely delightful. But then a fictional ancient world and Airfix soon followed by Minifigs is where i really got started back in '73. Good luck on this and may good fortune attend you. I'm very enjoying were your taking this! Behind the curve here, but curious why you didn’t go the 1/72 plastics approach like Mr A? Marc, I'm not a great fan of the quality of most soft plastic 1/72nd figures. Plus 28mm is really my go-to scale these days.